“Get your bead on” is the slogan that ‘on the fly products’, the company that makes this interesting new fly tying gadget, uses to describe the Beadmaster fly tying tool. 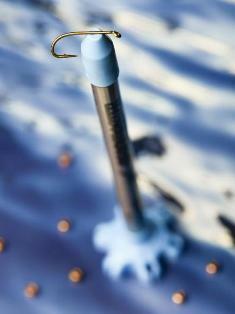 They say this tool will help you to easily and effectively place beads on your fly fishing hooks. So does it work? To be honest, ‘probably not as well as they claim’ was my first thought upon visual inspection of the product. Yes I’m a bit of a skeptic. So I felt it only proper in order to give it a fair review that I should at least spend some time actually using it. First things first, well, OK second to ripping open the bag, I went to the website and watched a short instructional video. No BS, I broke normal male tradition and got directions before using or building something! In fact, I watched it a couple times (sorry guys). It is a very short and painless video which I found to be not only informative but a good introduction on the tool and its use. For your convenience I will post the video at the end of this review. I’ve been blessed with 2XL hands so small beads and hooks usually make tying #16 chronies and the like a wee bit challenging. I’m also getting old(er) (rotten kids!) 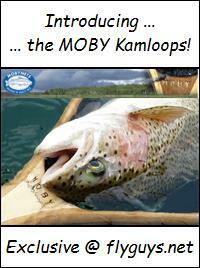 so my vision when fly tying is aided by 3X reading glasses and by turning on every source of light in the room! On occasion (haha who am I kidding it happens every time I hit the bench) I’ve even dropped a bead or two when opening the child proof little ziploc bag they come in and/or fumbling to manually get them little suckers on those tiny hooks!. And I swear those beads are self propelled when they hit the basement laminate! Gone, lost only to be found when stepped on! OK sorry, rant over, on with the review ……. 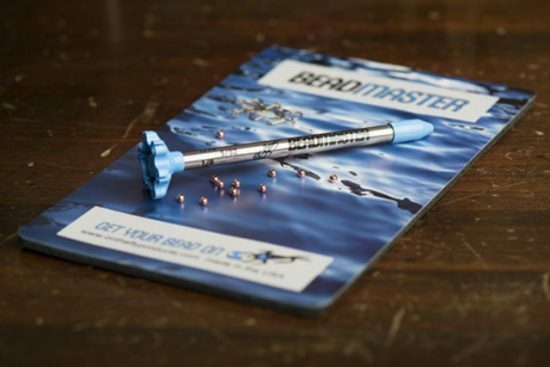 So after a bit of time working with the fly tying tool (old dogs and tricks) I do believe I am a convert and can honestly say that if you’re a person who takes pride in tying their own flies then you will want to check out the nifty little Beadmaster fly tying tool combo. Sure you can continue attempting to palm a few beads and then manually try to thread them onto your hooks without spilling any (ya right!). Or, you could shake a few from the evil ziploc bead bag onto the soft, quiet and slightly magnetic Beadmaster pad, where they will, with the exception of glass and plastic, stay put until you need them, and then use the Beadmaster fly tying tool to safely and efficiently place them on the hooks. 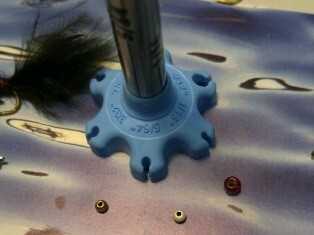 When placing the beads on the Beadmaster pads all the beads may not land ‘hole up’. I found that just a bit of tapping on the pad is enough to get them there. You can then align the bead to the corresponding sized hole on the ‘foot’ of the tool and simply push the tool down over the bead. Works as claimed. The bead is held solid … does not fall out … Sold! As for big hole up or down during this procedure, you can either spend the time to align them all before seating them in the foot or take comfort in knowing that the hook can be threaded into the bead in either direction (from the top or the bottom) so it really doesn’t matter. 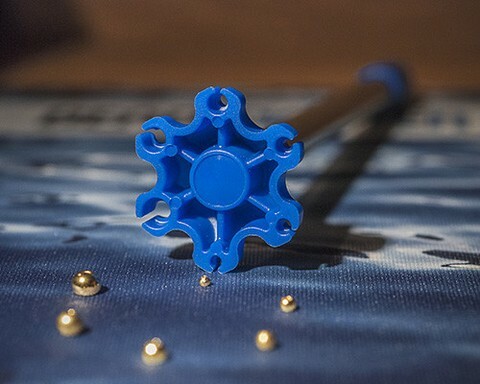 The other (top) end of the Beadmaster fly tying tool contains a magnet. OK I know what your thinking, a magnet and small hooks is a recipe for pricked fingers … right? Well in this particular case I would actually say no. Someone actually used a special magnet that is just the right strength and is cleverly oriented in only the very tip of the tool. They then coat the tip in a light blue industrial polyurethane that matches the base. I guess I should not leave out the stainless shaft that also has bead sizes printed on it that match up to the corresponding sized holes on the foot or base of the tool (if you spin base on the shaft). OK so as mentioned by this time I was convinced that the Beadmaster fly tying tool combo was definitely helpful for big clumsy old blind guys like me. But what about the young eagle eye hot shot fly tiers that don’t seem to have any problems threading on beads sans tools? What, if any, would be the benefits for them? To help me with this part of the Beadmaster fly tying tool review I solicited the help of my 25 year old daughter, the one with the opposite of big clumsy hands, and fingers that can type or text ridiculously fast. She is also pretty adept and handy with tools so I knew she would be perfect for the task. So first the ‘old way’ utilizing a pile of 5/64 beads and #14 2X hooks. After manually threading ten of the beads onto ten of the hooks her response was a very quick … “how do you, with your ape like hands and sausage fingers, even manage to actually get these tiny beads on without some sort of tool”! Umm, thanks for your input Courtney! 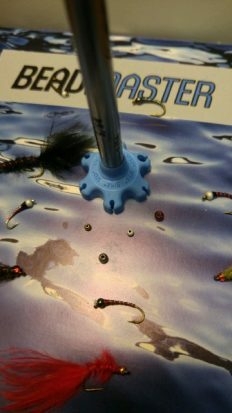 Next up, after a quick introduction and demo of the unit, was another ten beads onto ten hooks test utilizing the the Beadmaster fly tying tool. She was easily twice as fast with BeadMaster. Nuff said! I think we have a winner! So when all was said and done the Beadmaster fly tying tool proved more efficient for both myself and my daughter, neither of stabbed ourselves with a hook, no beads were dropped and the cussing ceased! So I’d say you can’t go wrong to take a bit of the money out of the swear jar and invest it in this useful fly tying tool! 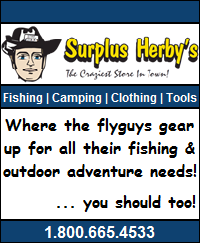 You can purchase one directly from the folks at on the fly products here! we will reply in short order! 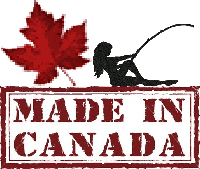 This entry was posted in Product Reviews and tagged bead master, beadmaster, beadmaster combo tool, beadmaster fly tying tool, Fly Tying, Fly Tying Beads, fly tying tools, flyguys, flyguys.net, flytying. flytying tool. Bookmark the permalink.